Clarifying filters are used to clarify water by retaining suspended particles in loose fill layers of the filter. The size of suspended matters removed is 20-40µm. Clarifying filters named also as sediment protection filters are widely used to remove sand, sludge, scale, rust and other small mechanical particles. 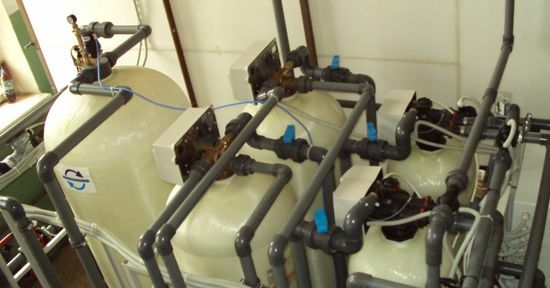 These filters are used both in small systems and in industrial water treatment plants with high capacities. Water is clarified by filtration, in other words, by retaining of contaminants (mechanical impurities) when they pass through a loose fill filter element. The filter is flushed excluding the use of chemical agents by means of filter material loosening and further filter flushing with clean water in direction contrary to the initial one. Chemical regeneration for this type of filters is not required. Advantages of water clarifying systems. • The clarifying filter does not require chemical regeneration. • The clarifying filter is mounted in a simple manner; this operation may be performed by unqualified and unskilled personnel. • The filter may be used with various filter media depending on the technology; these filter media variety ensures high quality of water treatment. • Fine-grained medium is used for film-type filtration. Suspended matters form a thin film around filter medium grains. Due to adhesion this film can retain on its surface particles the sizes of which are less than the sizes of channels between filter medium grains. • Coarse-grained medium is used for volume filtration. Insoluble particles move at random in channels inside loose fill medium. While moving foreign particles either enter channels which are narrower than these particles themselves or they are retained on the surface of sludge already settled. • Suspended matters move from water flow to the surface of filter medium grains. • Particles adhere to surface of filter medium grains. • Retained particles break loose and migrate back into passing water volume. Portion of loosened particles is transferred into deeper layers of filter medium where it is repeatedly retained (fixed). The clarifying process goes on as long as adhesion rate exceeds break loose process rate. The clarifying filter working period within which the latter efficiently performs its function varies in each case depending on working conditions. A type of filter medium, a composition of water being treated, water temperature and ph impact on work time duration. Filter medium flushing restores the filter to working condition. Flushing is performed in reverse direction using water at 40-60oc temperature. Preliminary loosening of filter medium (in filters with high capacity) with the help of compressed air is used for the process enhancement. Activated carbons, gaize, zeolites are strong adsorbents. During water filtration not only particles are retained mechanically but organic impurities are adsorbed in the filter medium layer. The majority of filter media is regenerated by back flushing. It is necessary to note that full restoration of carbon filter medium to working condition by hot water is impossible. Carbons shall be regenerated at 800-900oc temperature in special furnaces where adsorbed impurities shall be burnt. Filter media grades significantly vary between each other based on physical and chemical properties. Operation conditions vary significantly as well (thickness of a filter medium layer, flushing rate and regeneration modes). Some clarifying tests shall be conducted in order to select a filter medium that meets current conditions to the fullest extent possible. To select an appropriate model of clarifying filter please see the catalogue with models or contact the company’s technical specialist.